Teaser Tuesday: How and why did Esther become Mali? 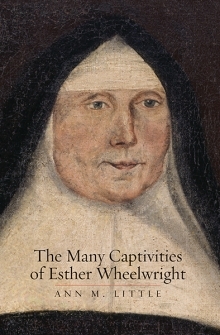 We’re back again on another Tuesday with yet another free sample from my new book, The Many Captivities of Esther Wheelwright, this time from chapter 2, in which Esther is taken captive by the Wabanaki, who care for five years, from age 7 to 12. How did Wabanaki women and men go about turning little Anglo-American girls and boys into their daughters and sons? Unfortunately, that’s something that Esther never wrote about or described in any detail at all in any of the documents that record her life. Chapter 2 is probably the chapter that stretched my imagination the most–you tell me if it ventures too far from history and veers into fiction. One of my techniques in writing this book was to imagine the bodily sensations Esther might have experienced at each stage of her life and journey. You’d be surprised how generative it is to ask simple questions like, was Esther warm or cold? What was she wearing? What did she eat for supper? Whose bed or blanket did she share at night? Throughout my career as a scholar, clothing has always struck me as a vitally important issue in cross-cultural encounters in early North America–everyone talks or writes about it, and moreover it’s also a vehicle for thinking about labor, trade, politics, and cultural change. Here’s a little sample of how I approach Esther’s introduction to life among the Wabanaki. I introduce here a recurring motif through the book of Esther being stripped of her clothing and redressed in garments appropriate to the new culture she’s living in and/or the new stage of life she has entered. Most captives were ritually stripped of their English clothing and then re-dressed in Native garments, which by the late seventeenth century included European or Euro-American-made wool blankets and linen shirts or shifts. These were worn by both sexes and all ages, in addition to traditional aprons, wraps, and leggings made of deerskin. The hair of male captives may have been cut or plucked, and their skin painted or tattooed. So too, their bodily movements and utterances were remolded to match their new appearances: singing and dancing were a central aspect of Wabanaki captivity rituals. Art and Picture Collection, The New York Public Library. 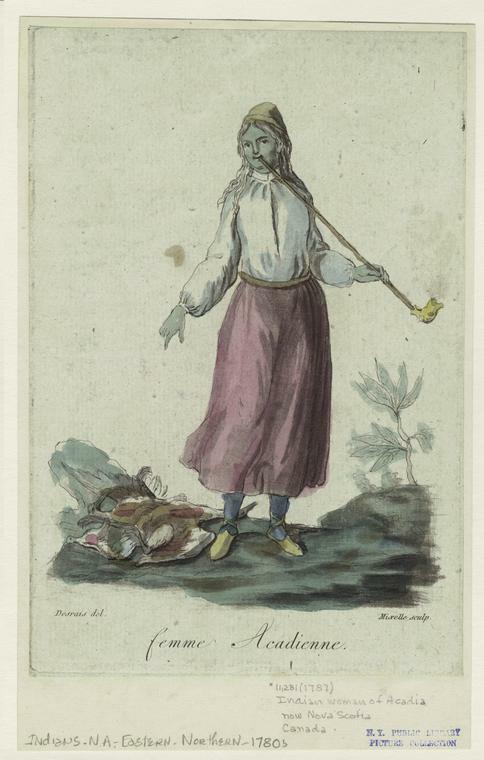 “Femme acadienne.” New York Public Library Digital Collections. Accessed October 16, 2016. As a girl of only seven, Esther would not have been subjected to the public trials and rituals that greeted [adolescent] Gyles. Her Wabanaki mistress—perhaps the woman who became her mother—would have performed a much gentler initiation into Esther’s new way life. She would have taken off Esther’s woolen skirt or petticoat, her stays, and her shift in private. Her filthiness might have shocked the Wabanaki woman—after all, Europeans and Euro-Americans in the seventeenth and eighteenth centuries thought it unhealthy and perhaps even dangerous to bathe by immersing their bodies, whereas Native people commonly indulged in cold-water baths in ponds, lakes, rivers, and streams. So Esther’s new mother or big sisters might have first insisted that she bathe, and then that her body be rubbed with the bear grease that Wabanaki people used as an emollient and that may have soothed or offered some protection from insect bites. She was then probably dressed again, given a shift or other woven shirt worn loose, and probably little else since it was still August. Her mother may have had a skin apron or woolen blanket, moccasins, and snow shoes ready for her use come autumn and winter. 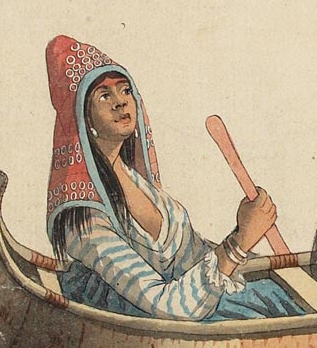 Wabanaki woman’s red woolen hood with blue ribbon trim and trade silver (detail from image below). By the turn of the eighteenth century, Wabanaki women’s clothing was a mixture of European cloth and clothing and traditional moose- and deerskin garments, and frequently decorated in a distinctive fashion. Women’s woolen hoods or peaked caps were cut in a distinctive style and elaborately decorated with ribbons, beads, and colorful needlework. Women and men alike wore trade silver brooches, rings, earrings, cuffs, and medals along with Wabanaki-made copper beads. All of these rituals—singing and dancing, stripping and redressing, cutting hair, applying tattoos and body paints, and even cutting, mutilation, and savage beatings—were ritual practices focused on the body: its movements, its voice, its presentation, and its sensations. In the absence of a shared language, eastern woodlands Native rituals for captives seem to have been designed to turn outsiders’ bodies into insiders’ bodies from the outside in, perhaps so as to bind them more effectively to their new families. These physical sensations and ordeals were probably highly effective in teaching captives the ways of Wabanaki life and the roles they were expected to play in their new families. Language would come more slowly, but learning to dress, sing, move, and sit like a Wabanaki was a good place for most captives to start. One bit of language may have been given to her shortly after her arrival, as she was undoubtedly renamed. Esther, with its hard r-finish, is a name that would not have sounded right or been pronounced easily by either Wabanaki- or French-speaking peoples. In the late seventeenth and early eighteenth centuries, most Catholic Wabanaki women who were baptized seem to have been named either Catherine or Marie—although they pronounced Marie as “Mali,” like the English name Molly, because in fact, there is no r-sound in Wabanaki. At this point in the story, Esther becomes Mali for the time being. This is also the time in which Mali was taught to pray as a Catholic–the most life-changing transformation of her time among the Wabanaki. The image below suggests some important things about the ways in which Wabanaki clothing and adornment had changed over 150 years of European invasion, colonization, and mission life. The people depicted here by James Peachey at the end of the eighteenth century are swathed in yards and yards of European woven clothing–deerskin and moose hide are little in evidence, except perhaps in the pink-looking leggings worn by the central male figure. Although this family, like their elders throughout the eighteenth century, were eager to use European cloth and clothing, they wore it in distinctively un-European fashion. If you click on the image, you can see an enlarged version–better to appreciate the way this family is decked out in trade silver. The men are especially so, with silver ear bobs, cuffs, rings as fringe on the man on the right, and what looks like a gorget-sized medallion hammered into a buckle worn mid-chest by the man on the left. The women are more modestly dressed and adorned, but even the adolescent girl looks like she has a nose ring. Only the dog is in “Adam’s livery,” as he helpfully offers a paddle to a human, who can presumably use it more efficiently. Next week–rumors of Wabanaki cannibalism: could they be true? Thanks! I’m enjoying them because I can pull back the curtain, as it were, and talk about process and the decisions that go into writing. Definitely interesting, and inspiring, to see behind the curtain. I’ve been thinking of a rather fine-grained geoographical approach to exploring the experiences of an author about whom I’ve been writing, and you’re making me feel more confident that that’s a viable approach (how far would she have walked on a regular basis? where? whom would she have encountered? how would her habits near home have influenced her choices when she found herself in a very different environment? These are, of course, perfectly reasonable questions, but somehow I find myself doubting them, as somehow *too* material, or perhaps too influenced by the idea that we can get at an unmediated truth or reality of history. But getting as far as we can with the information available about physical realities doesn’t mean that we’re ignoring the importance of ideas/interpretation of that physical data, or the existence of gaps/unknowables). Exactly, Cassandra–we can walk AND chew gum/think great thoughts. Why choose? You have certainly increased the percentage of the (at-least academic) population that would have any idea what the word “wimple” means, if we ran it as a word cloud. I’ve wondered that “mouldy britch” hasn’t gotten more traction in modernity, as a term-of-art in the world of playground banter and sartorial challenge. Maybe it will yet. To boil a bunch of issues down, to what extent do Peachey’s portrayals of Natives represent realism, idealism, and cultivation of the perception of otherness? They do all that, 100%–just like oil portraits of the so-called Founding Fathers, and those are always popped onto book covers unproblematically. Sketches and watercolors like Peachy’s are also all we have to go on for Native people, and the clothing depicted here matches descriptions of what Native and Metis people were wearing in the 18th C. I also just think the Peachy illustrations, as Indyanna suggests, are really beautiful and worthy of more publicity! TNX – my impulse on the art is always to compare it against the text texts. I spent a bit of time browsing Peachey’s stuff today – and indeed – it is good stuff – especially as an avid canoer. The dog is also a culturally appropriate touch. I’m thinking of including a dog, and a discussion of Wabanaki dogs, in Teaser Tuesday next week! Yes, the canoes are pretty boss. That’s some BMW or even Aston Martin-level of attention to detail in the Peachey image above. I’m on kind of a James Peachey jag now. The DCB says that “Nothing has been discovered about his early life or training.” That’s like a red flag in front of a bull, or a dish of catnip on a linoleum floor to me. Died 24 November, 1797, likely in Martinique. How can they know it down to the day, but not place? Somebody ought to get on this guy. Good questions by Profane. The British army had a lot of good artists, draughtsmen, and cartographers. With what liberty they operated is not really known. Wow, so you just decided that she might have been called Catherine or Mali, and went with it – interesting! Very bold, and definitely risking veering into fiction, as you mention, but it seems like it might be worth it. Did any of your readers, friends or formal reviewers, have a problem with this? No pushback–not yet, anyway! I go with Mali, mostly because we know that it becomes a part of her religious name (Marie Joseph de l’Enfant Jesus) as a teenager, and because it seems like nearly every Wabanaki woman was called Mali (or Molly) in the 18th & 19th Centuries. Taking on a new name is something she does through her life, so each chapter traces her progress by the different names she’s called by (Esther, Mali, Esther Anglaise, Sister Marie Joseph de l’Enfant Jesus, Mother Esther, Esther Superior, Esther Zelatrix). I haven’t heard the word “boss” used in that connotation (as for canoes, above) since I was back there at the old 2ndary school. 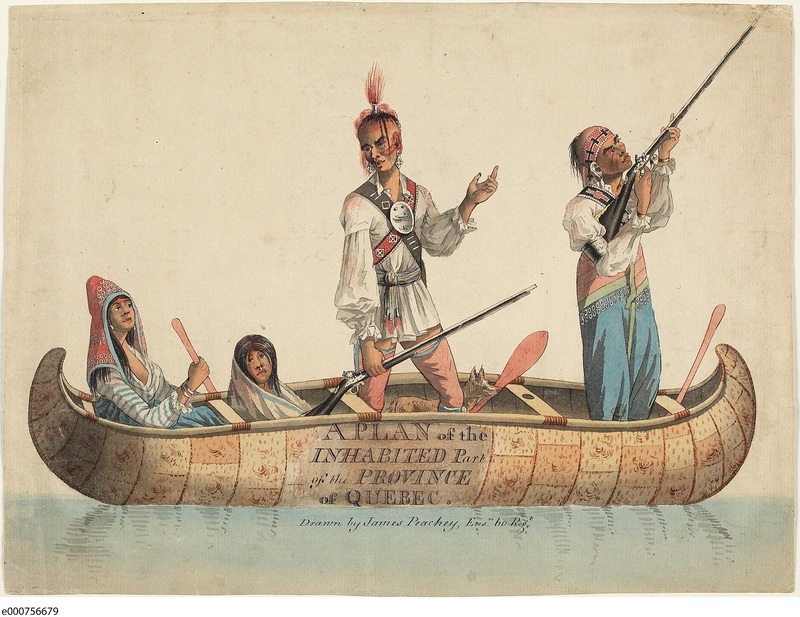 I was wondering about the reference on the canoe’s side to a PLAN of the Inhabited part of Quebec &c. Was this image the cartouche for a map, and is there a citation? British army mapmakers were pretty amazing graphic artists, creating some important geographic evidence for British North America. Would be cool to see. Strike on, here, and going well, for the first day. Question: When and how did social norms shift in the United States from the American/European avoidance of bathing to today’s American norm of washing daily, or close to daily? I get the feeling it was pretty recent.